It was my first time to buy something online. I wanted to buy a bag so i searched at ebay.ph. 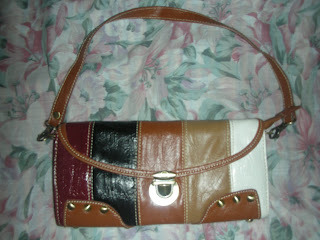 I saw a Mango striped sling bag (new w/ tag) worth Php 400 only so I started to watch the item. Other sellers were also offering almost the same style but in a different color. 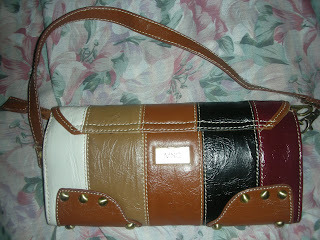 But I liked the one with a white strap and a buckle & studs at the center so I chose to purchase on that particular seller instead. Just to be sure, I didn't bid online anymore. I texted the seller the next day after I've seen the bag online. I asked why she's selling the item for a low cost, then she answered that she bought it wholesale from Singapore. So there, after proving that the item was really authentic, I decided to buy it. 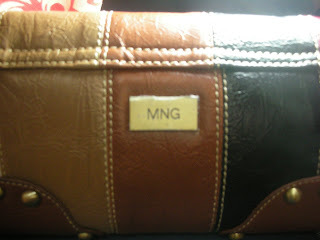 Then she asked me what bag was I talking about, so I said it's the mango striped sling bag. She gave me her GCash info so I sent her money the next day. After another day, the item arrived, but I was able to open it only the day after that 'coz I wasn't i the office when it was delivered. The bag looked nice and I felt happy about it, however it somehow felt weird . I just didn't know why. The night of that same day I used the bag at a party. After two days, I decided to check my ebay. Then I saw there that the original photo of the bag I chose was a bit different from the bag that was delivered to me. So I figured it out! The bag I checked online had a white piping instead of brown. Its straps were also white (bothe long & short straps). I remembered choosing that because I planned to match it to the outfit I was supposed to wear in an upcoming party. Also, in my original choice, the white stripe was at the center and it had studs lined down on that surface and it also had a different lock, the one with a buckle. In fairness to the seller, she's very accommodating and fast with the transaction. So I texted her about my concern. She told me that the white-strapped one was out of stock that's why she indicated in her item post that it was "brown" (inside a parenthesis). And that I think I didn't notice. Regardless of that, she still used a different photo for a certain item, and she didn't mention that during the time that I was inquiring to her via text. Then she told me that the original item posted was already out of stock. Oh my. Now, I have mixed emotions. I'm happy that I got a new bag for a very reasonable price; yet I feel kinda disappointed 'coz it's not exactly the item I wanted.